Membrane filtration has always provided a way to simplify and automate the water treatment process and at the same time enhance water quality. At Enviro Concepts, membrane filtration is a regular part of our industrial or commercial water treatment plants that we provide for businesses and communities, in Australia and around the globe. What Membrane System Do You Need? Water treatment plants use various types of membranes to filter surface water, rivers, lakes and reservoirs, groundwater or sea water to produce potable water for drinking and recycled water for reuse in the industry. Different types of water treatment processes will require different membrane filtration systems. Membrane filtration removes unwanted constituents from water. 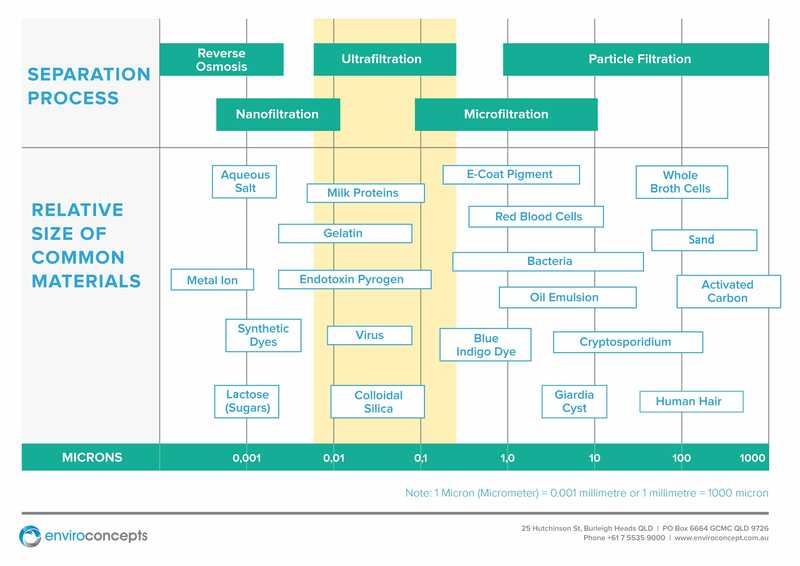 Microfiltration and Ultrafiltration remove suspended solids and colloidal particles like sand and silt, algae and bacteria, among others, and can be used as standalone systems or pre-treatment for Nanofiltration (NF) and Reverse Osmosis (RO) systems. NF and RO remove finer contaminants and dissolved solids like chemical compounds, metals and salts, and smaller pathogens like viruses and pyrogens. What does your treatment process need? You can contact us for a free quote and consultation. In Australia, the use of membrane filtration (microfiltration, ultrafiltration and nanofiltration) is used as part of drinking water treatment for non-saline sources, especially due to stringent drinking water regulations. Use of UF produces high-quality filtered water. UF units are compact and can often remove over 90% of pathogens. An ultrafiltration membrane has pores that are in the nanometre range. They prevent particles, colloids, microorganisms and dissolved solids that are larger in dimension than the pores in the membrane surface from passing. The membrane, therefore, acts as a physical, size-exclusion barrier, and it is for that reason that ultrafiltration membranes produce high quality water. When treating water with high suspended solids, UF is also integrated into the process using some primary and secondary pre-treatment stages. Enviro Concepts provides a low cost, safe potable water commercial range with UF Filtration. The standalone units have low power consumption and require minimum operator attendance. This compact and unique range provides sustainable, safe cleaning water for various applications. The units have a simple “plug-in” connection for easy installation and maintenance. The units use proven hollow fiber membranes to disinfect primary water by removing pathogens and particulates, providing clean and safe drinking water from the majority of non-saline surface and ground waters. The units have an effective backwash process that uses low-pressure aeration and keeps the membrane clean even when there’s highly turbid feed waters. This unique process cleans the filter membrane during wash cycles. Contact us if you are interested in learning more about our industrial or commercial UF filtration process.